On December 24 afternoon, on the riverside of the To Lich River in Hanoi, the river which has been well known to everybody with its high pollution level, Dr. Tran Hong Con from the university and his associates showed to the public how they could filter the polluted water to get drinkable water with NanoSky mineral filter. The technology product is for the first time 100 percent made in Vietnam. In the witness of scientists and local reporters, Dr Con took five liters from the To Lich River – called as the “dead river” by Hanoians, and poured it into NanoSky. The water looked black and gave a bad odor. Especially, according to Con, the water contained many kinds of toxic heavy metals with the concentrations at ten times higher than the allowed levels. Just after five minutes, Con got drinkable water which ran out from the machine. The water looked pure. Con and two reporters then drank the filtered water. They did not show any expression that they were drinking waste water and they seemed to enjoy it. Other people, who were present there, also drank the water and said there was no odor and taste in the water. According to Dr. Con, the biggest advantage of NanoSky is that it can maintain the substances useful to people’s health after the filtration. The invention has been put into commercial development. The first machines have been made and marketed by the Nano Technology Research and Utilization JSC, which is priced at 3 million dong per product. Especially, the machine does not need electricity to run, does not generate waste water. It is small but has high processing capacity (5-8 times higher than the machines using other technologies). In general, the machine can make out 50 liters of drinkable water within one hour. Daplennhaumasong, another member of the forum, has questioned if the technology is so magic that it can eliminate all parasites, harmful bacteria and viruses. “I got excited when hearing about NanoSky. 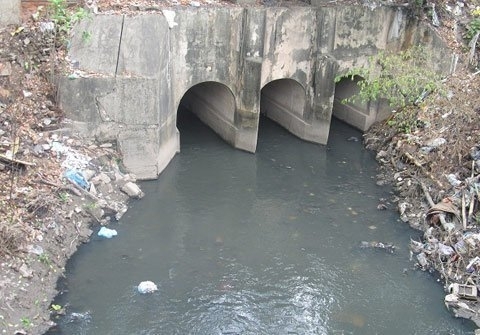 If it really can filter the To Lich River’s water, it would be able to clean the water from anywhere,” said Nguyen Hong Nhung, a housewife in Cau Giay district. However, Nhung said she still does not believe such a machine exists. Dr. Nguyen Trong Uyen from the Hanoi University of Natural Resources has confirmed that there is scientific research on the water treatment. He also said that the technology is believed to be friendly to the environment, because the filter units would be reused in other works after the filtration. Uyen has confirmed that the modern technology can thoroughly treat the polluting elements most popular in Vietnam. Especially, this is a “green technology” which does not discharge toxic waste water to the environment. Since it does not run on electricity, it can be used by the people in the flooded areas or rural areas which lack clean water.